These thermometers are used to verify sample temperatures in freezers, refrigerators, incubators and ovens with traceability to NIST, DAkkS and most standards through ILAC. Ideal for chemical industry, petrochemistry, pharmaceutical, medical, cosmetic, producers of chemicals, university, dairies, breweries, distillers, beer cellars, refrigeration house, hot houses, scientific institutes, blood banks, refrigeration/freezer/incubator/oven equipment producers and producers of laboratory equipment. Each model features individual serial numbers and a Statement of Accuracy indicating accuracy traceable to NIST. Tested and calibrated in our exclusive triple accredited/registered ISO/IEC 17025:2005, A2LA accredited laboratory against equipment whose calibration is traceable to NIST. 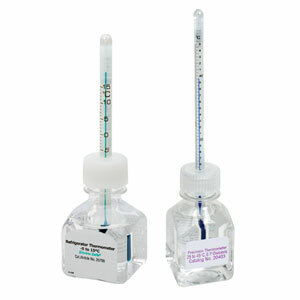 These thermometers feature PFA flouropolymer safety coating and a multi-language (English, French, German, Italian, Portuguese and Spanish) Statement of Accuracy indicating accuracy traceable to NIST and DAkkS.